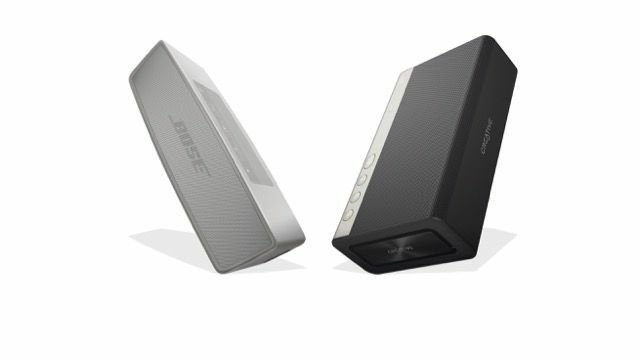 Bose and Creative portable Bluetooth speakers deathmatch! The original Bose SoundLink Mini was a star act, and its successor the Mini II (£170) delivers a touch of class, while Creative's new SoundBlaster Roar 2 (£149) is for those who like it large and loud. We pit the two Bluetooth speaker offerings against each other to find out which gives you more portable audio performance for your buck. Compact, with a robust aluminium casing, the Mini II is scientifically gorgeous. The player docks with a matching charging stand, juiced by a USB connector. For added colour, you can customise with optional soft covers. This thing oozes posh. The Roar 2 is somewhat bigger than the Mini II. The chassis looks conventional but it cleverly accommodates two passive radiators as well as a trio of forward-facing drivers. A plethora of switches and ports hint at extreme versatility. Don't expect a surfeit of frippery here. Beyond speakerphone functionality, Bose keeps things lean and mean (there's not even NFC). Still, there's a purity to its design and performance that's admirable. Battery life is around ten hours. As well as Bluetooth and NFC one-touch pairing, the Roar 2 can play back MP3s and WMAs from Micro SD, and record voice calls and tracks from speakerphone and wireless streams. It has a USB port for charging connected mobile devices, too. The Mini II is sonically sensational. Speakers fore and aft create an omnidirectional soundstage, while twin mid-range drivers and a central tweeter deliver a dynamic, refined sound. It goes loud (79dB SPL at 1m) and boasts Tate & Lyle highs. It may lack the absolute finesse of the Bose,but the Roar 2 goes louder (we clocked 85dBat 1m), and it has two DSP modes: Tera Bass for low-volume listening and Roar to crank things up.We grinned. A lot. This Bose doesn't have a learning curve; it's ruler-flat. A voice prompt helps set things up, and you'll be paired in moments. On-body controls are nicely tactile, while the charging stand is both practical and smart. It's a dream to use. The Roar 2 is like an audio Swiss army knife. Not only is the feature list class-leading, you can even connect via USB directly to a PC and use the device as your desktop sound system. The battery lasts around eight hours. Rates:The sound quality is rich, clear and frankly awesome for the size, the chassis is beautifully designed and, at just 0.67kg, it's easily transportable. Slates:Features are meagre; it doesn't even have NFC. Rates:It sounds fulsome, goes loud, and has four playback options (Micro SD, PC, aux and Bluetooth). Slates:It can sound overly sharp, and that Roar modeis borderline bonkers.